Click here to view and build customized maps of active fires in Mesoamerica through SERVIR and MODIS. GOES-12 Wildfire ABBA: Biomass burning products. Shows current "hotspots" of fire-events with 30 minute delay. From: Meerman J. C. & W. Sabido 2001. Central American Ecosystems Map: Belize. Volume 1. Fire as a threat to biodiversity and the status of the vegetation, is not well understood. The frequency, magnitude and effects that wildfires have had on biodiversity in Belize have not been documented. However, the dimensions of areas destroyed during these fires strongly imply major destruction of flora and fauna" (Rosado in: Jacobs & Castaneda, 1998). The ecological consequences of fire in natural ecosystems are many and have been listed by Wade et al (1980). Fires in broadleaf forests are often ignored and bear no resemblance to the massive blazes that can be seen in burning needle-leaf forests. The fire is usually low, and slowly creeping through the leaf litter. Often it is possible to walk close up to it and even through it without too much danger. There is usually little "media value" in such fires. Only in areas with Cohune (Attalea cohune), the effects can be more dramatic. The abundant leaf litter under these palms explodes into flames, often igniting the crown and spraying sparks over great distances. But even in the case of these slow, low fires, the damage can be profound. Trees, especially young trees may appear unharmed but still die over time. The mortality either being the result of direct damage or indirect damage such as increased pathogen access through the fire damaged bark. Tree mortality as the result of such slow fires may continue for several years after the actual fire (pers. obs.). Each fire, which leaves more dead or dying trees behind makes the forest even more prone to fire damage. 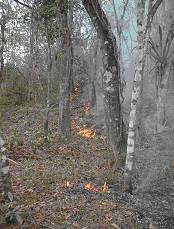 Fire in broad-leaved forest is a relatively rare phenomenon. It is argued that in Central America most species of trees have evolved in the absence of fire and thus developed little tolerance for it (Budowski, 1966, Hopkins, 1983). Actual documentation of lowland broadleaf forest fires started by lightning is rare (Middleton et al., 1997). Consequently, fire in tropical lowland forests has traditionally been considered as human induced (Janzen, 1986; Koonce & Gonzalez-Caban, 1990). This view was also taken by the TFAP team when considering the causes for fire in the Southern Coastal Plains (ODA, 1989). This is also the reason why fires are treated here as part of the human impact factor. On the higher peaks of the Maya Mountains, however, lightning strikes appear to be the major cause of forest fires. Nearly 2/3 of the fires recorded in the Mountain Pine Ridge Forest Reserve are reportedly caused by lightning strikes (ODA, 1989). Wolffsohn (1967) suggested that about once in every five or ten year the dry season in Belize is intense enough to create hazardous conditions. The vegetation is generally too damp to burn easily. This is especially the case in "real" rainforest but evidence of rainforest fires (dating many thousands of years back) has been collected throughout the tropics (Bassini & Becker, 1990; Horn & Sanford, 1992). Many of these large fires show a relation to human presence and it is often assumed that early man was directly or indirectly responsible for these fires (Horn & Sanford, 1992). It is generally accepted that once every one or two centuries a series of abnormally dry years without rainy seasons dramatically increase the fire hazard on otherwise fireproof tropical rainforests (Jacobs, 1988). There are indications that the incidence of rainforest fire is on the increase worldwide. In 1982, 1983, 1992, 1993, 1997, 1998 and 2000, large surfaces of rain forest burned throughout the tropics. This increase is most likely caused by increased human encroachment on the forest and by the phenomenon of global warming (which is expected to lead to more erratic weather patterns including more frequent droughts). This is especially worrisome since these wildfires are gaining importance to the volatilization of gasses such as N2, N20, CH4, CO2 and other greenhouse gasses, i.e. those that contribute to global warming (Lugo, 1995). Fires are most devastating on hills where an upward draft creates extremely hot fires towards the top of the hill. Fire affected hills; therefore, show the greatest damage towards the summit. Repeated hill fires result in "bald" hills with no woody vegetation but a cover of grasses or "Tigerbush" (the ferns Dicranopteris and Pteridium caudatum). The influence of fire is clearly greatest where there is drought stress and highly inflammable vegetation is present. Fire induced vegetation in hilly areas are especially at risk since the fire resistant vegetation has a lesser capacity of retaining the soil and increased erosion is the result (Jacobs, 1989). In the early days of the Forest Department it was noted that fire kept broad-leaved forest species from invading and replacing pine on soils which otherwise might have carried high forest. Nevertheless, pines are liable to be killed by fire when they are less than 3 m tall and are liable to damage at any age and size. The old-growth pines on the Southern Coastal Plain are frequently fire-scarred, internally and externally. The damage allows the ingress of wood-rotting fungi and termites and materially reduces the net yield (ODA, 1989). Data from the Forest Department over the period 1963-1970 for the hills of the Mountain Pine Ridge Forest Reserve (Cayo district) indicate that out of 46 recorded fires during that period, 29 (63%) were reported to have been caused by lightning. The remaining 17 fires (37%) were caused by human agency. In the northern Coastal Plain of Belize, the great majority of the lowland fires are caused by arson, by hunters after game (ODA, 1989, pers. obs.). 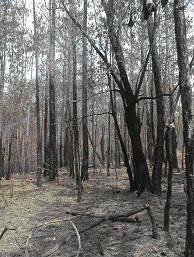 In contrast, in the pine barrens of Florida, lightning strike is a frequent cause of fire (Lugo, 1995). The combination of infrequent lightning strikes and a degree of fire adaptation in the savannah and needle-leaf community indicates that fire is a natural part of the Belizean savannah ecosystem, probably helped by the droughtiness of the vegetation and naturally occurring more frequently than in broadleaf forest. That said, the natural savannahs would be much smaller in extent and not burnt so often as is presently the case. The Belizean Forest Department has had little success in fire control, even in the pine plantations. The staffing and equipment of the Forest Department have been so reduced that the fire protection scheme (Johnson, 1974) has never been implemented successfully. The priority areas for fire control outlined in the fire protection scheme have been so affected by wildfire that the stocking of healthy live trees appears to have been reduced below any level that would justify the expense (ODA, 1989). Belize has experienced massive fires in broad-leaved forest after hurricanes, which cause large amounts of debris. Initially, these fires are usually started by farmers and may be accidental escapes from farm clearings. The debris caused by the hurricane is such that access and movement for firefighters is very difficult. Consequently, these fires are difficult to suppress unless they can be reached at a very early stage. Fire in broad-leaved forest may stimulate the regeneration of mahogany and cedar but more usually there is complete destruction of forest and replacement by persistent bracken, which is itself a fire hazard (Johnson & Chaffey 1973). For the same reason selective logging practices also create favorable conditions for the spread of wildfires. Not only do the discarded crown and branches provide fuel for fires, also the resulting scrubby growth following the opening of the canopy is usually more incandescent than the original forest. More than anything, slash and burn agriculture has to be seen as the main culprit for fires in lowland broadleaf forests. In general the subsistence farmer has little consideration for the well being of the forest and most farmers do not take escaped "milpa" fires seriously. And the 1998 effort by PFA (1998) clearly shows that most fires occurred near human habitation (Figure left), this map also shows that the fire intensity is higher in neighboring countries where the human pressure is higher. Observations in the field show that burned hill tops are virtually always connected with agricultural clearings in at the foot of the same hill. The only noteworthy exceptions seem to be some fire damaged areas well away from any activity on a hillcrest of the Maya Mountains. Lightning strike is the most plausible explanation for these burned areas although agriculture is present at the feet of some of these same hills and fire-creep below the canopy remains a distinct possibility. Concluding, the importance of fire in the Belizean ecosystems has largely been downplayed but is probably of major, and increasing, significance. More investigations are needed to establish the actual impact and possible measures to prevent the damage caused. This fire risk map (map to the left, click for larger image) is highly theoretical but with the availability of MODIS fire data it was possible to test the theory behind the fire risk map with the reality of annual fires and the this comparison is presented above as well (map to the right, click for larger image)(but this is changed as a result of hurricane damage as was the case in 2011). Clearly the actual fire situation shows a very strong correlation with the theoretical risk. Some "unexpected" fires do occur in "low" and "medium" risk areas, but it appears that in most of these cases, agricultural expansion is the main driver behind this. Clearly the model does not well in predicting agricultural expansion. Otherwise the model seems to represent actual fire-risk very well. Bassini, F. & P. Becker. 1990. Charcoal's occurrence in soil depends on topography in terra firme forest near Manaus, Brazil. Biotropica 22(4): 420-422. Budowski, G. 1966. Fire in tropical lowland areas. Proceedings of the annual tall timbers fire ecology conference. 5: 5-22. Dwyer, J.D. & Spellman, D.L. 1981. A list of the dicotyledoneae of Belize. Rhodora 83 (834) pp 161-235. Hopkins, B. 1983. Succesional processes. In: F. Bourliere (ed.). Tropical Savannas. Pp. 605-616. Elsevier, New York. Horn, S. P. & R. L. Sanford. 1992. Holocene fires in Costa Rica. Biotropica 24(3): 354-361. Jacobs, M. 1988. The Tropical Rain Forest, a first encounter. Springer Verlag. 295 pp. Jacobs, N. D. & A. Castaneda. 1998. The Belize Biodiversity Strategy. Belmopan 2 vols. Johnson, M. S. 1974. The Belize Forest Department Southern Coastal Plain Fire Protection Scheme. Land Resources Division. MoD, Misc. report 187. Johnson, M. S., and D. R. Chaffey. 1973. An inventory of the Chiquibul Forest Reserve, Belize. Land Resource Study No. 14. Land Resources Division, Surrey, UK. Kauffman, J. B. 1991. Survival by sprouting following fire in the tropical forests of the eastern Amazon. Biotropica 23(3): 219-224. Koonce, A. L. & A. Gonzalez-Caban. 1990. Social and ecological aspects of fire in Central America. In: J. G. Goldammer (Ed.). Fire in tropical biota. Pp. 135-158. Springer Verlag, Berlin. Lugo. A. E. 1995. Fire and Wetland Management. In: Cerulean, S. and R. T. Engstrom (eds.). 1995. Fire in wetlands: a management perspective. Proceedings of the Tall Timbers Fire Ecology Conference, No 19. Pp. 1-9. Tall Timbers Research Station, Tallahassee, FL. Middleton, B. A., E. Sanchez-Rojas, B. Suedmeyer and A. Michels. Fire in a tropical dry forest of Central America: A natural part of the disturbance regime? Biotropica 29(4): 515-517. ODA. 1989. Belize Tropical Forestry Action Plan. 273 pp. PFA. 1998. Atlas Centroamericano de incendios. Programma de desarollo sostenible en zonas de frontera agricola. 51 pp. Panama. Wade, D., J. Ewel And R. Hofstetter. 1980. Fire In South Florida Ecosystems. USDA Forest Service General Technical Report SE-17. Southeastern Forest Experiment Station, Asheville, North Carolina. Wolffsohn, A. F. A. 1967. Post-Hurricane Forest Fires in British Honduras. Commonwealth Forestry Review 46(3): 233-238.